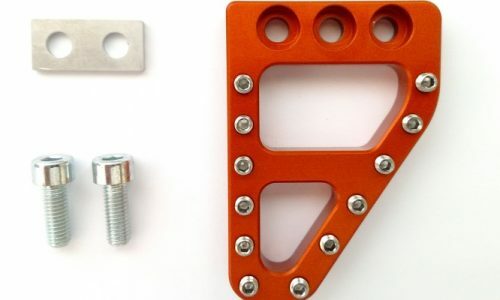 This rear brake pedal pad is the same size as the OEM pad for the 690/701 and 950/990 and .4″ (~10mm) larger than the pad used on the 125-530 off-road bikes. See our comparison chart in the images to the right. All Clean Speed pedal pads offer billet strength, customization through the stainless steel teeth and it looks super cool. 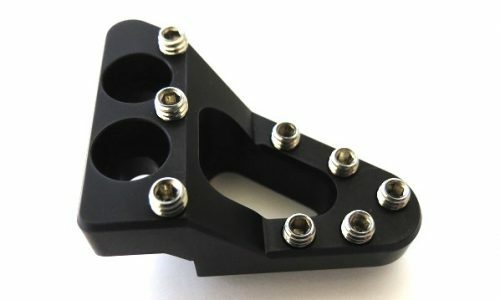 All required mounting hardware included. All of our products are made with pride in the USA. 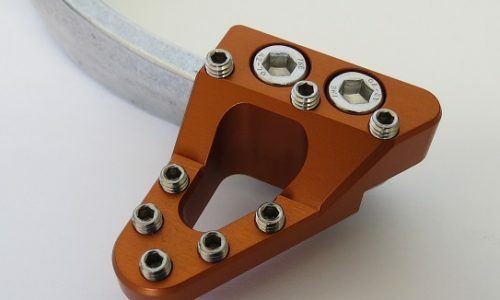 *Fits all Clean Speed rear brake pedals. *Fits OEM 690/701, 950/990 and 1090/1190/1290 rear brake pedals. 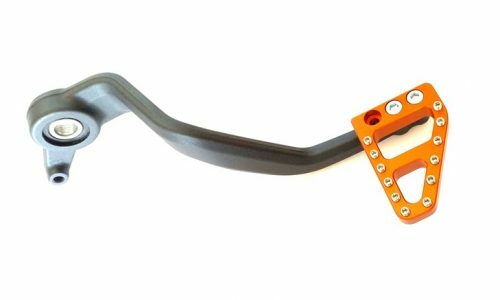 *Fits 2003-2015 KTM 125-530 OEM rear brake pedals. *Fits 2016 KTM and Husqvarna models except SXF, XCF and FC. 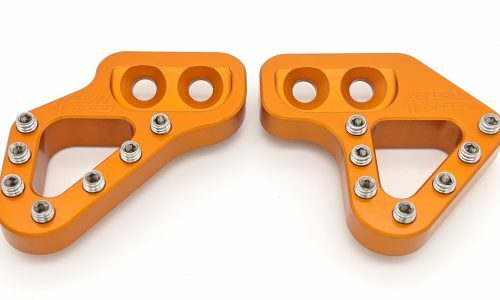 *Does not fit 2017 and up KTM and Husqvarna off-road models (125-501) which have an angle mount surface. One contact area for standing and one for when you sit down and your toes drop. 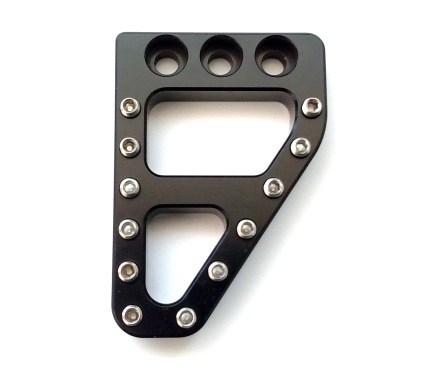 Same width and length as the stock 690/701/950/990 pedal pad (KTM OEM P/N 60013051000). See our pedal pad comparison chart in the images to the right. 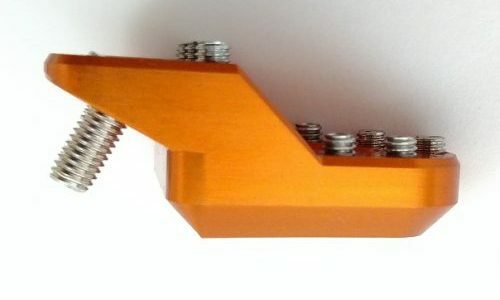 The upper contact area is the same height as stock. The lower contact area is dropped approximately .37″ (9.4mm). 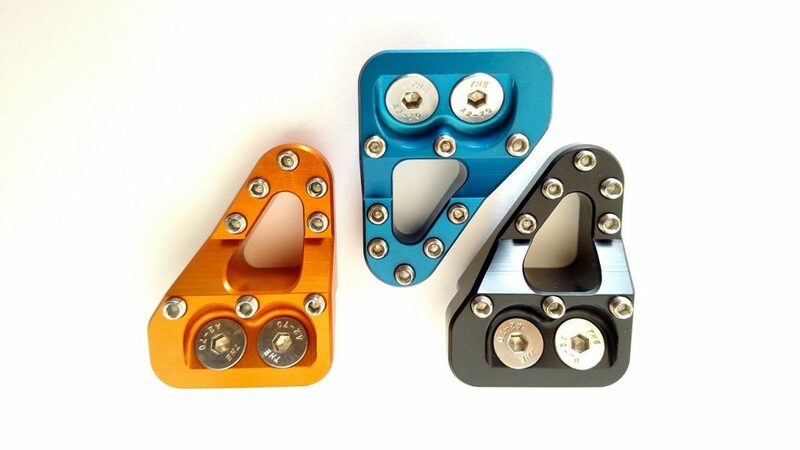 All Clean Speed pedal pads offer billet strength, a grippier surface and customization through the stainless steel teeth and it looks super cool. All of our products are made with pride in the USA. 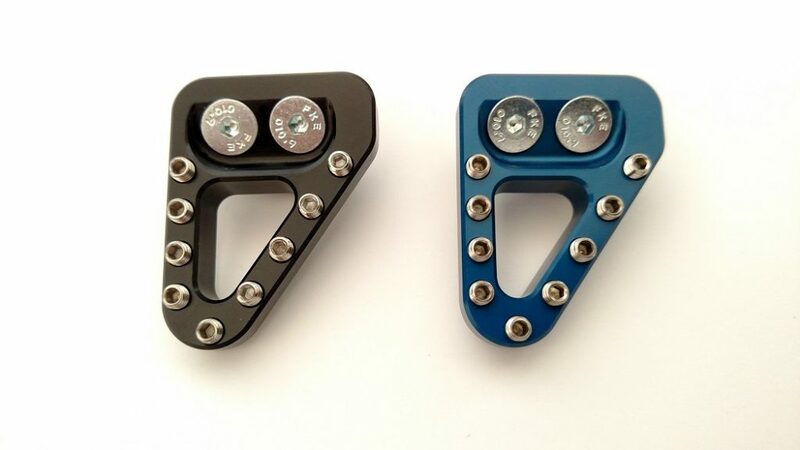 Dropped, over-sized brake pedal pad – This rear brake pedal pad is larger than stock and features a dropped surface that caters to riders who prefer to sit rather than stand. 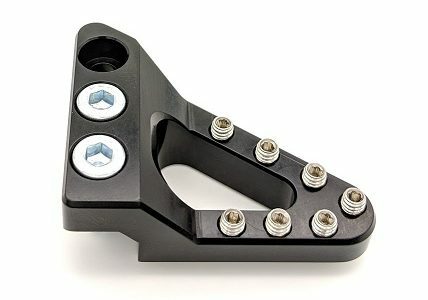 It also offers the option of two mounting positions – the stock position and pulled back towards the footpeg .45″ (~11mm). See our comparison chart in the images to the right. 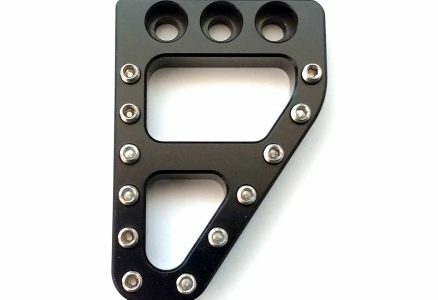 This Dropped brake pedal pad will fit our 690/701, 950/990 and 1090/1190/1290 Clean Speed pedals and the stock 690/701, 950/990 and 1090/1190/1290 pedals. 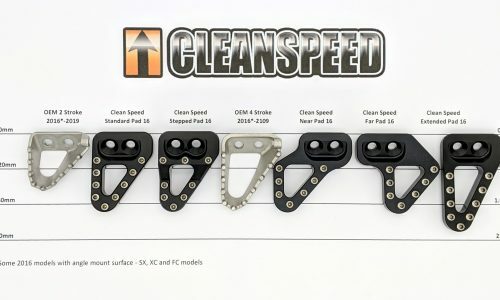 All Clean Speed pads offers billet strength, a grippier surface and customization through the stainless steel teeth. All of our products are made with pride in the USA. 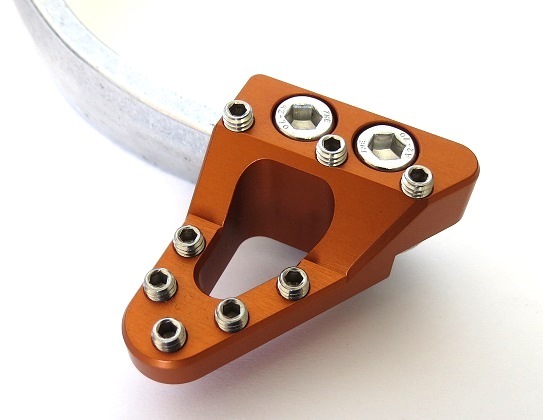 *Can be used with 125-530 dirtbikes with small modification to the OEM brake lever. 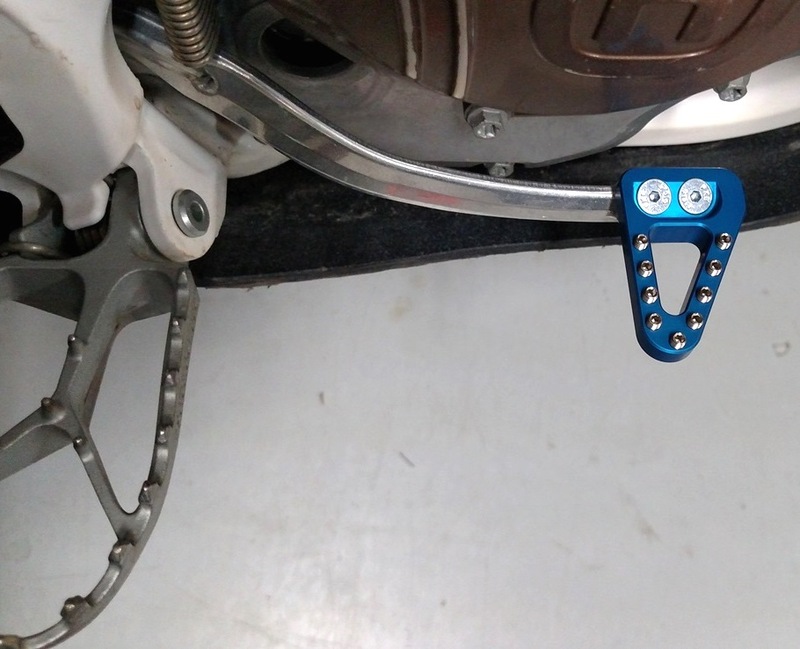 *If you plan to use the Dropped Pad on a 950/990 or 1090/1190/1290 in the optional position that moves the pad towards the rider, leave a note in the Note section when checking out and we will include the required spacer. 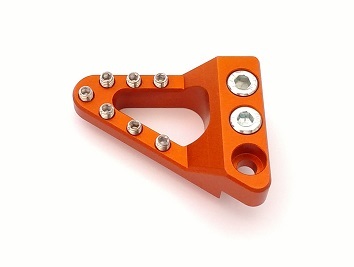 Over-sized rear brake lever pad for KTM and Husqvarna dual-sport, supermotos and dirt bikes. 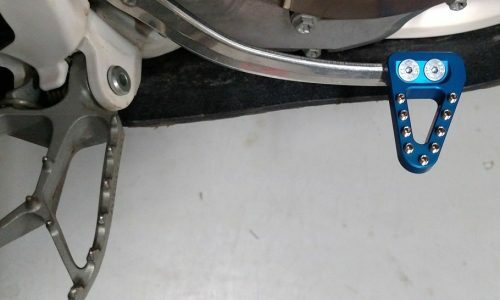 This rear brake pedal pad is slightly larger than the stock 1090-1290 pedal pad and significantly larger than the 690/701 and 125-530 brake lever pads. See our comparison chart in the images to the right. 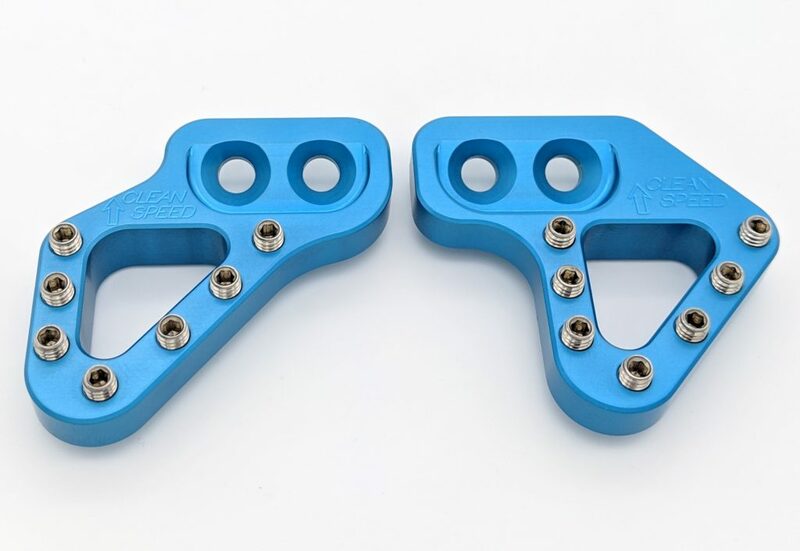 All Clean Speed rear brake lever pads offer billet strength, a grippier surface and customization through the stainless steel teeth. All of our products are made with pride in the USA. 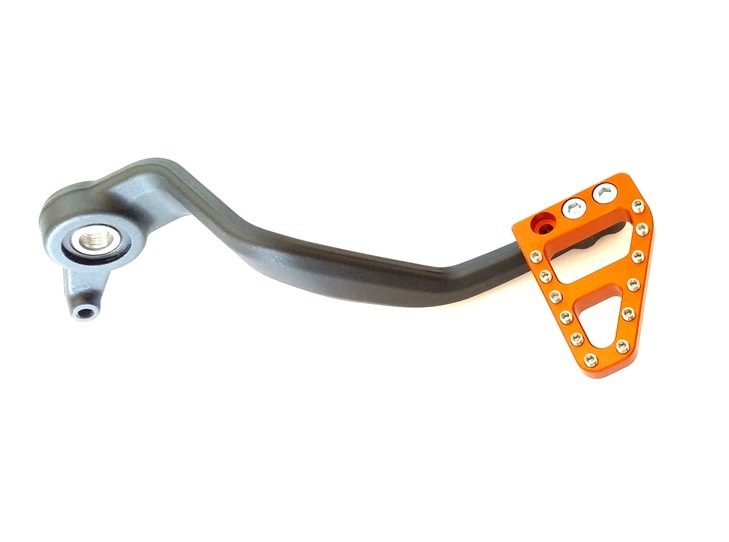 Over-sized, dual-position brake lever pedal pad for KTM and Husqvarna dual-sport and supermotos. 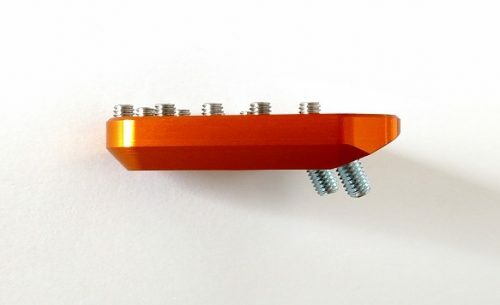 This rear brake pedal pad is significantly larger than the stock pedal pad by .4”-.8” (10-20mm). See our comparison chart in the images to the right. 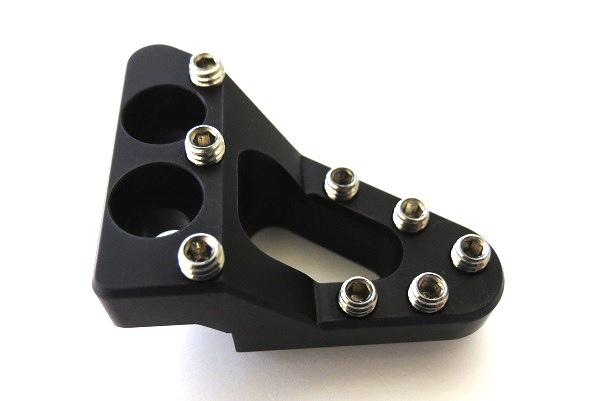 The pad also offers the option of two mounting positions – the stock position and pulled back towards the footpeg .45″ (~11mm). All Clean Speed pedal pads offer billet strength, a grippier surface and customization through the stainless steel teeth. 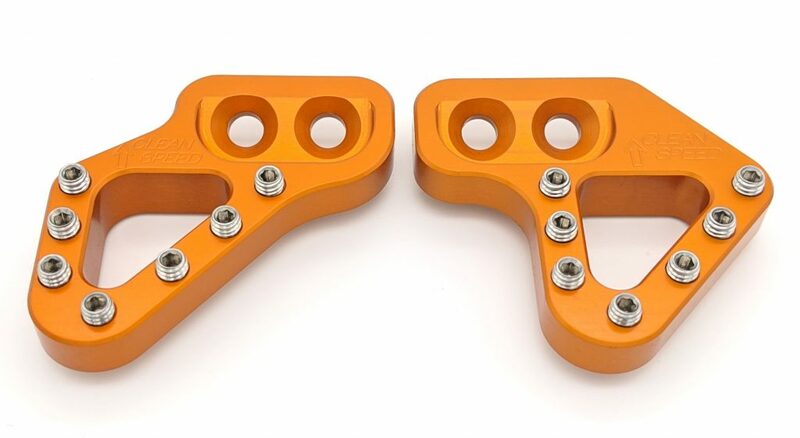 The pad is .4″ (~10mm) wider, and .8″ (~20mm) longer, than the stock 690/701/950/990 pedal pad (KTM OEM P/N 60013051000). 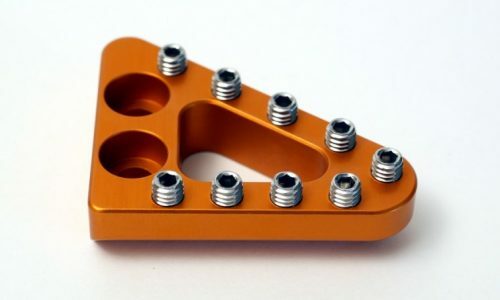 The pad is .4″ (~10mm) wider, and .4″ (~10mm) longer, than the stock 1190/1290 pedal pad (KTM OEM P/N 60313051000). All of our products are made with pride in the USA. 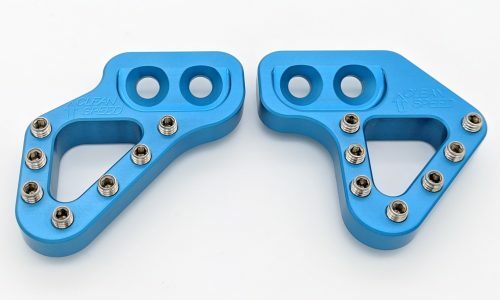 This rear brake pedal pad offers billet strength and a design geometry that makes it much stronger than the stock part. It uses replaceable stainless steel teeth that allow for customization and you can freshen it up if the teeth ever wear down. All this and it looks super cool. All required mounting hardware included. All of our products are made with pride in the USA. This pad is the same size as the OEM 4 stroke pad, which makes it approximately .4″ (10mm) wider than the OEM 2 stroke pad. 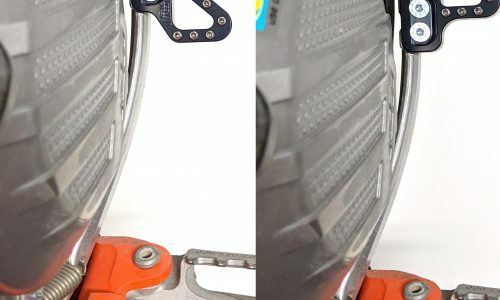 If your 2 stoke pad is too small, this will give you an extra .4″ (10mm) of pad to catch with your foot. *Fits all 2017 and up KTM and Husqvarna offroad models. *Fits 2016 KTM SXF and XCF and 2016 Husqvarna FC models. *Does not fit KTM or Husqvarna big bikes (690-1290). 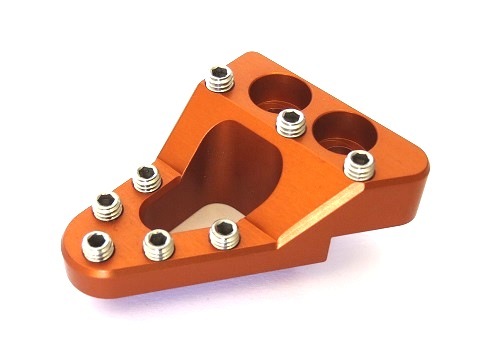 This rear brake pedal pad is approximately .4″ (10mm) wider than the OEM four stroke pad. If your four stroke pad is too small, this will give you an extra .4″ (10mm) of pad to catch with your foot. 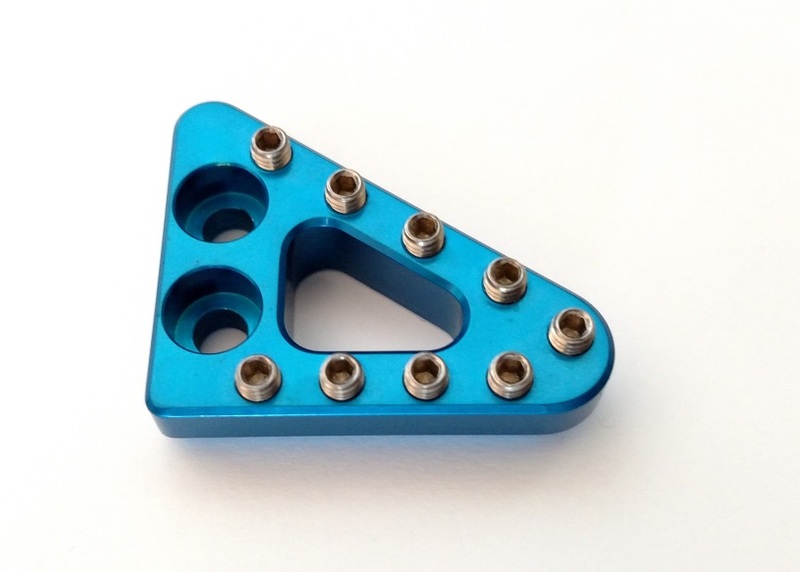 This pedal pad offers billet strength and a design geometry that makes it much stronger than the stock part. 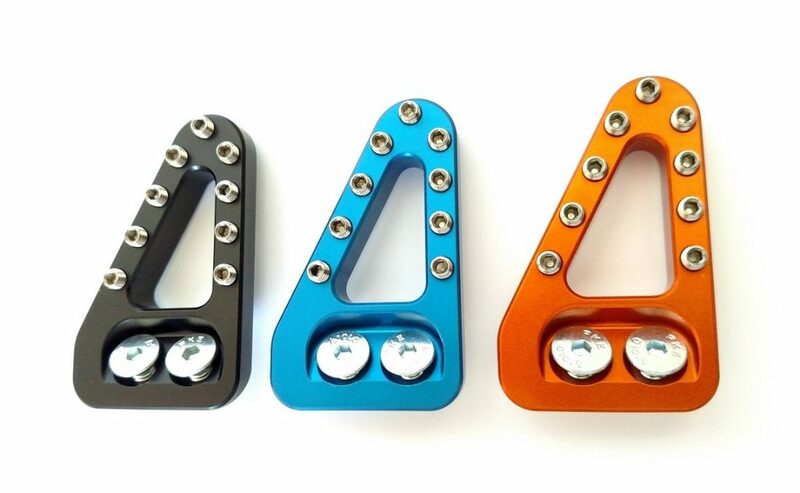 It uses replaceable stainless steel teeth that allow for customization and you can freshen it up if the teeth ever wear down. All this and it looks super cool. All required mounting hardware included. All of our products are made with pride in the USA. 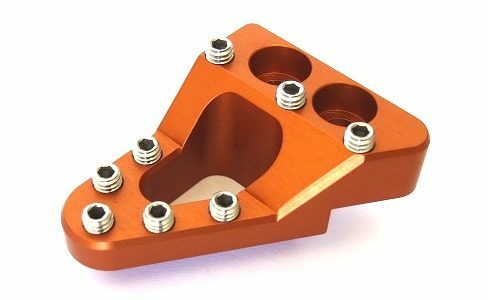 These rear brake pedal pads are the same width as the OEM four stroke pad but are moved closer or farther from the foot peg by .6″ (15mm). 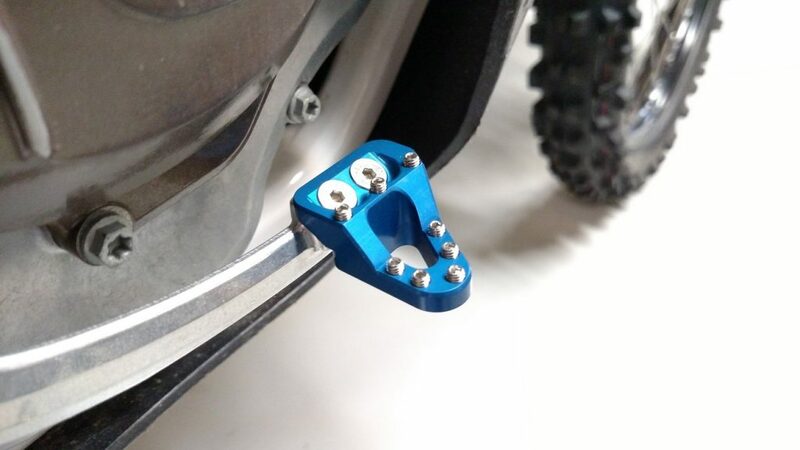 Moving the position of the brake pedal pad to match boot size and/or riding position can greatly improve your rear brake feel by placing the pad under your toes where it should be. 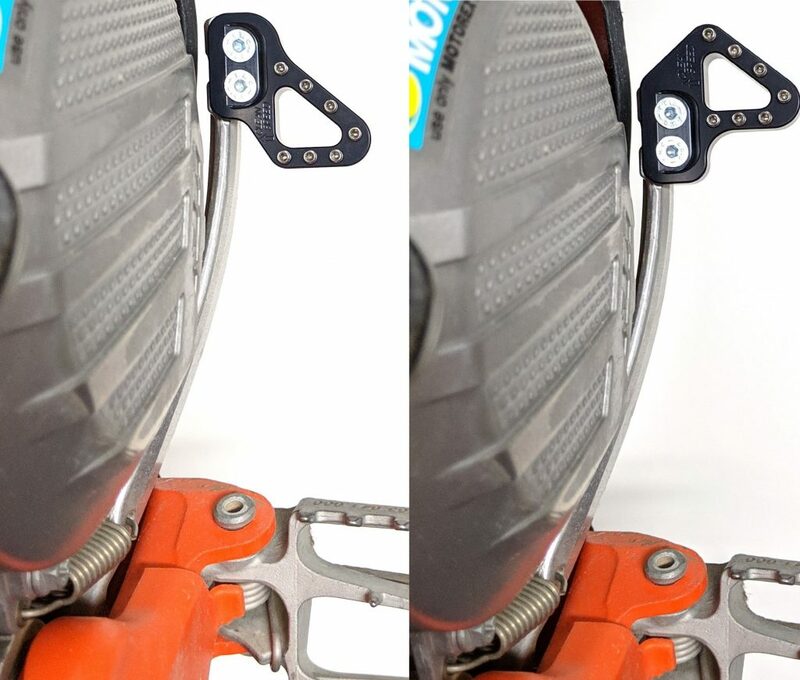 See our Angle Mount Comparison chart to the right or at the top of the page for relative sizing. 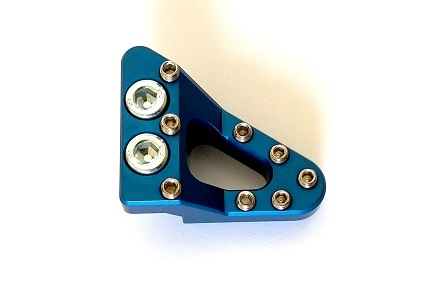 Stepped brake lever pad – One contact area for standing and one for when you sit down and your toes drop. 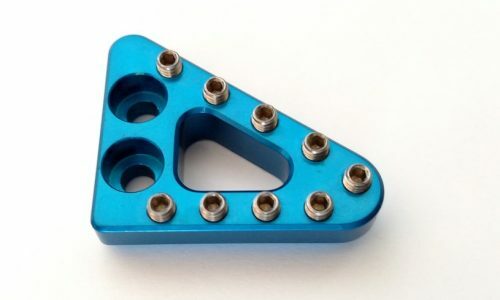 This rear brake pedal pad offers billet strength and a design geometry that makes it much stronger than the stock part. 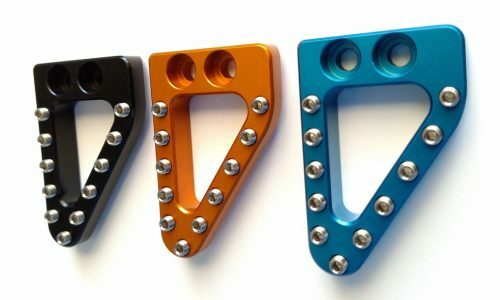 It uses replaceable stainless steel teeth that allow for customization and you can freshen it up if the teeth ever wear down. 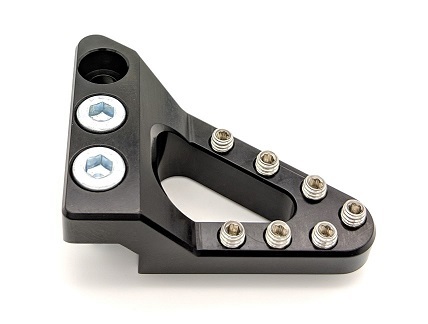 The upper contact area is stock height and the lower contact area is ~.4″ (10mm) down. The size of the pedal is ~1.4″(35mm) long x 1.8″(46mm) wide. 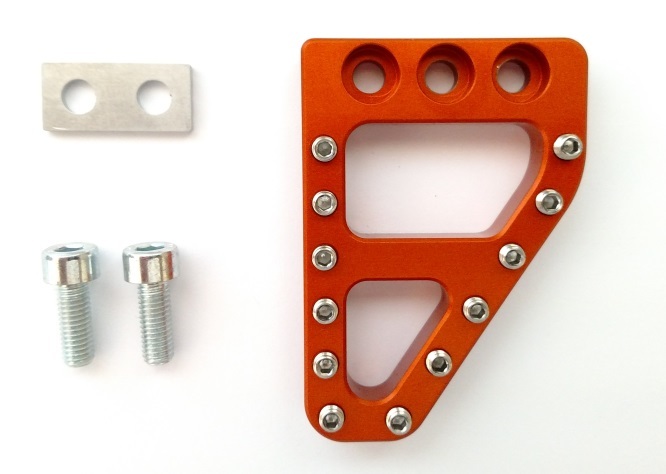 All required mounting hardware included. All of our products are made with pride in the USA. 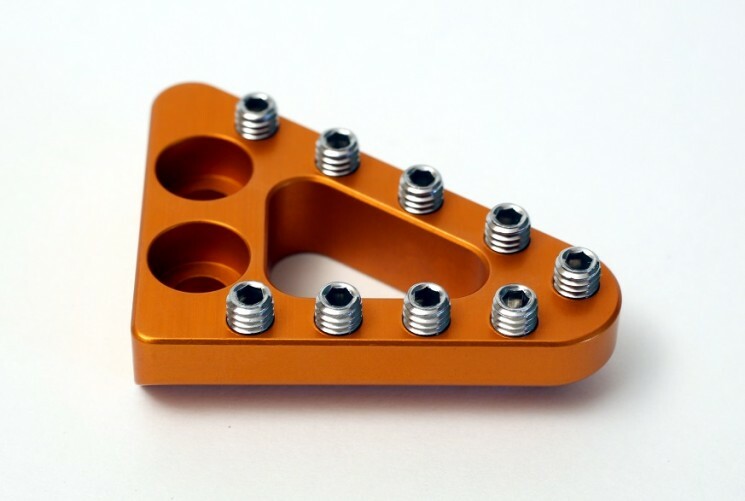 HARDWARE – All required mounting hardware included. 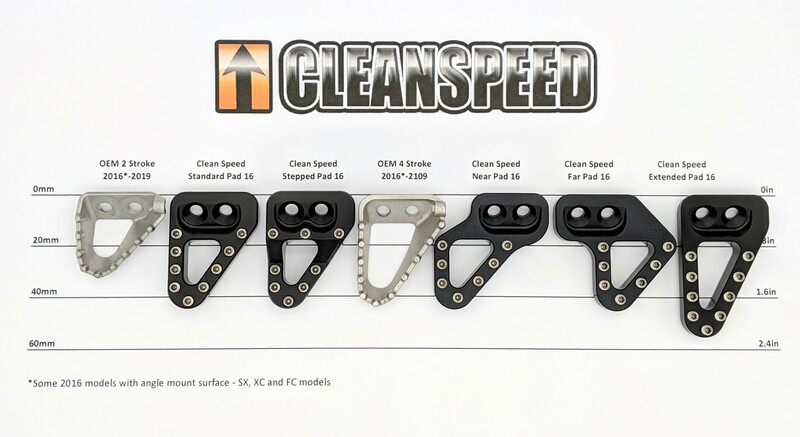 ACCESSORIES – All Clean Speed pad heights can be raised using our extended cleat set found on our Accessories page. 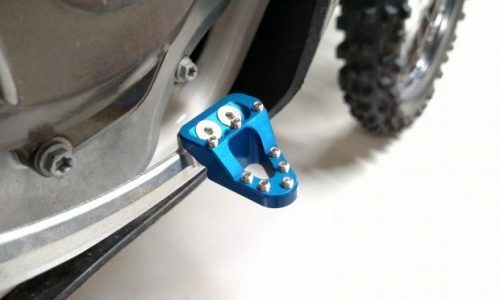 DROPPED PAD – If you plan to use the Dropped Pad on a 950/990/1090/1190/1290 in the optional position that moves the pad towards the rider, leave a note in the Note section when checking out and we will include the required spacer. 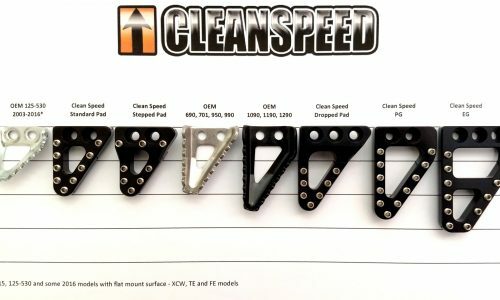 SHIPPING – If you are shipping international and would like pricing on different shipping options, please email us at jim@cleanspeedeng.com with your address and the product you’re interested in. Otherwise, a flat shipping rate for USPS Priority will be applied at checkout. PAYMENTS – On line payments securely processed with PayPal. CREDIT CARD – If you don’t have a PayPal account, follow the link at checkout and it will instruct you on how to use a credit card. 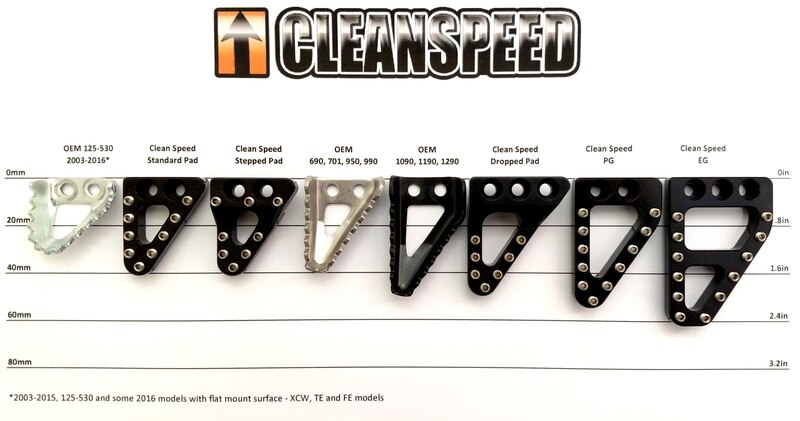 LIABILITY – Clean Speed Engineering (CSE) LLC is not responsible for any issues resulting from the use of our products.